SteemHunt is a new decentralized application (DApp) in the market that uses the Steem blockchain. 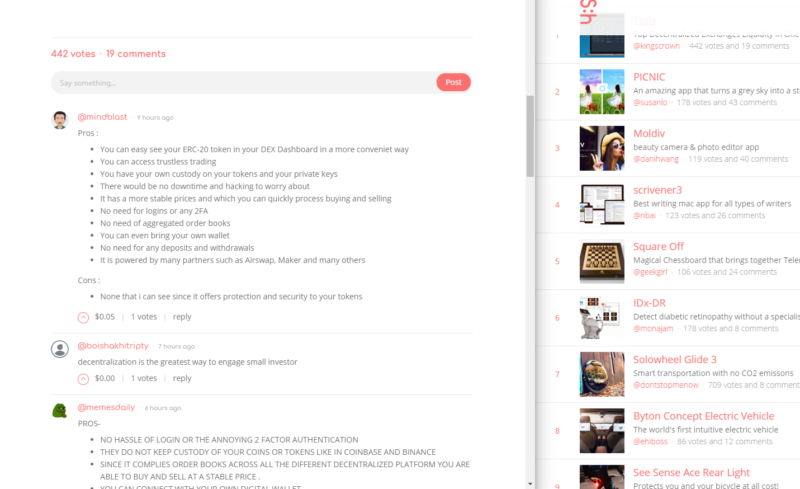 It’s really similar to Product Hunt, which is a well known platform where users can curate new and cool products. The only disadvantage of Product Hunt is that curators don’t actually make money from curation. This is where SteemHunt has a clear advantage. It actually rewards you for curating products, but your product submission has to be approved. 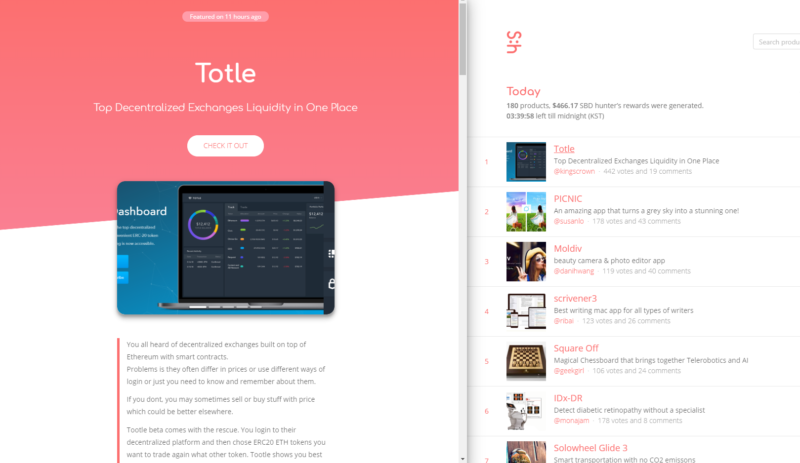 This is the front page of SteemHunt. You will see a listing of products and the highest paid submissions of the day. At the left side, you’ll have a button to “learn more” on how SteemHunt works. As you can see, users can submit products that they find on the internet, and the emphasis is on newer products. A team of moderators decide if a product should be approved based on the guidelines they have published. Do read the guidelines for much better clarification on this issue. Also, take note that the guidelines may change frequently. To be safe, just follow the SteemHunt account on Steemit to be notified of updates. There are a lot of criteria involved in their guidelines, and one of it is that the product must be novel. The products should also be tech related. It doesn’t necessarily mean super new, but an old product can also be novel if it was only recently discovered. If you click on one of the products, the site will display the description of the product as written by the hunter himself. You can also view the comments on the products if you scroll down. This is a screenshot of the comment section. How do you earn on SteemHunt? At the moment, SteemHunt still uses upvotes to reward the hunters. The good thing is that you can be rewarded through various ways. You can be rewarded for posting, commenting, voting, resteeming or even delegating Steem Power. But how are rewards given on SteemHunt? Is it paid in cash? I’ve explained this many times on other DApps on the Steem blockchain, like DMania, DLive and DTube. You can read those articles to get a clear picture on how rewards are earned on the Steem blockchain. This article is also useful for a better understanding of the Steem blockchain. To put it simply, you earn from upvotes by other users. The more Steem Power a user holds, the more value his or her upvote is. This means a rich follower (whale) can give you a higher upvote than 1,000 ‘poor’ followers (minnows). Fortunately for you, SteemHunt has a massive Steem Power delegation currently and they can reward you handsomely. The method in determining the amount they should reward you depends on your daily ranking. At the moment, the highest payouts determine the ranking, and those on top get paid even higher, which isn’t fair. However, they are going to change the algorithm very soon to be fairer, but the exact formula is not released. If you have an account on Steemit already, signing up is just logging in with your private key. Otherwise, there are two options, one is free and the other is not. The free option is registering via Steemit, where it takes a few days or weeks to get your account ready. Another option is by using a service like anon.steem.network to purchase an anonymous account. You can use BTC, LTC or Steem to pay. Once you have an account, you will receive several private keys which are essentially your password. Use your private active key to log into SteemHunt. Avoid using your master / owner key anywhere just to be safe. One you’ve logged in, you can submit your first post. If you click on the (+) sign beside your profile picture, you’ll get to this page. 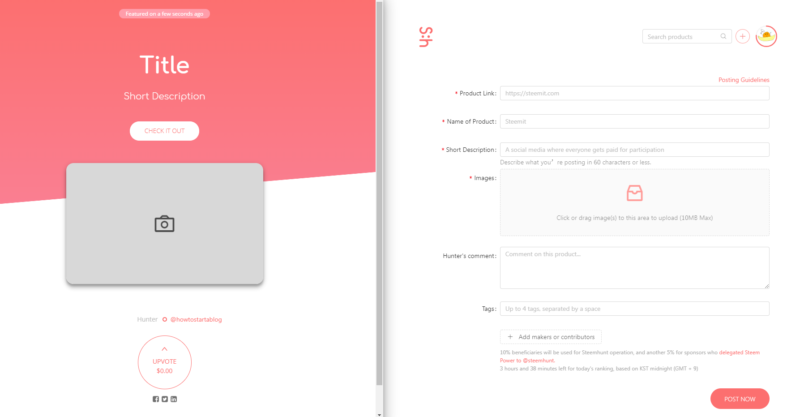 Just fill in the details like the link to the product page, product name, description, images, your comments and tags. You don’t even need to write a super long essay. Just use your own words and describe the product and why it’s novel. Note that products that have been submitted in the past cannot be submitted again. The screen on the left reflects what you type on the right side. It’s basically a preview. Once you’re done and happy, click the “Post Now” button and that’s it! As some of you may know, Steemit Inc will be introducing Smart Media Tokens (SMTs) sometime this year (or not). SteemHunt will be creating their own SMT, meaning their own tokens. It’s sort of like the Ethereum network, where OMG, BAT and Decent.bet are all ERC20 tokens. SMTs have the same concept where anyone can create their own tokens, but these tokens are tied to the Steem blockchain. As SMTs are not out yet, they have started reserving portions for their token distribution. 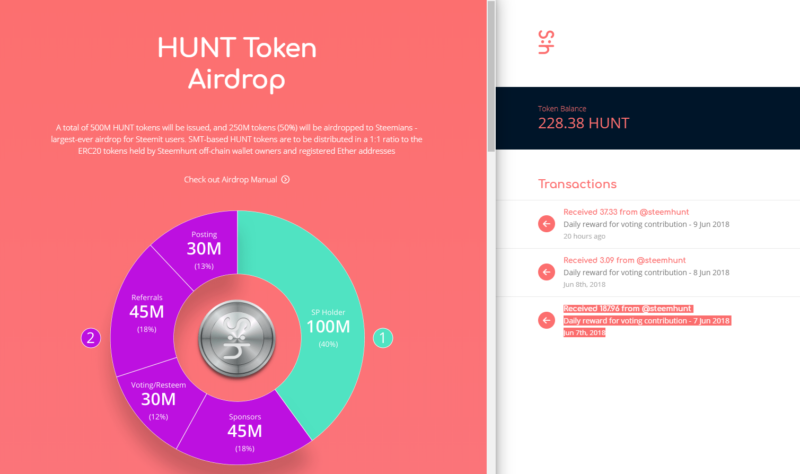 It’s their HUNT token airdrop and the distribution is as follows. They will be distributing tokens for posting, referrals, voting/resteem, sponsors and Steem Power holders. You can start earning token reservations right now! This means you can earn Steem and Steem Dollars, and at the same time you earn a portion of HUNT tokens. SteemHunt is a new project that is aimed at becoming the top product curation website. Product Hunt is becoming more of a place where makers advertise their products, instead of users curating them. As SteemHunt is incentivized, more people will likely join and get paid for their efforts.